The first round started at 22:00 UTC. In round 1, pachi2 and AyaMC played the first 20 moves very fast, both using their joseki books. AyaMC needed to think about move 21, but pachi2 was still in its book and did not need to think until move 26. In round 2 MyGoFriend did nothing for 90 minutes in its game with Orego12. Its operator then logged in using its account and did something to resolve the problem. 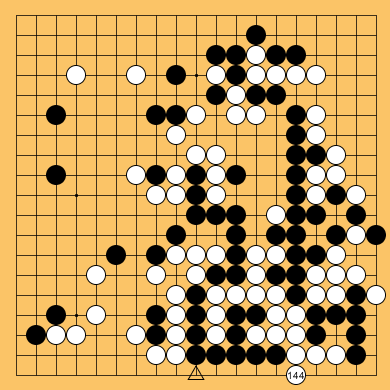 MyGoFriend then played normally, until Orego12 resigned in a totally lost position. The game is shown in the players' game records as a win by MyGoFriend. However MyGoFriend's operator's intervention caused it to be regarded as a loss by forfeit for MyGoFriend, for the purposes of the tournament. - the "W+Forf." means that this score was not based on win or loss on the board, but through other reasons. In this case, MyGoFriend logged in as a human and was promptly handed a loss. The game was not cancelled, though, so they were able to continue playing. Looks like MyGoFriend was cheating and the TD did exactly the right thing by giving them a loss by forfeit. Of course there is no suspicion of cheating here. But the KGS server does not understand that. I warn participants in these events: if you log in to your bot's account during a round, using the human client, it will be assigned a loss by forfeit. In round 3, Orego12 and AyaMC played even faster than in AyaMC's round 1 game, putting 31 stones on the board in the first 10 seconds. In round 4, AyaMC and MyGoFriend disagreed on the status of some stones after both passing. They entered the clean-up phase, and both handled it correctly. In round 5, gomorra16 deadlocked against MyGoFriend, and lost on time. 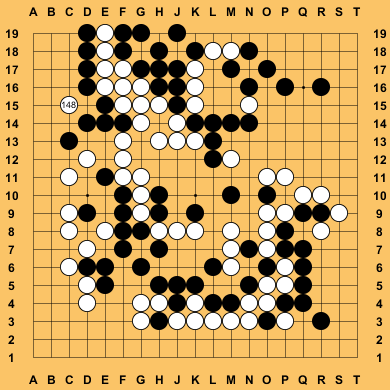 In the round 7 game between Zen19S and pachi2, a ko started with move 127. Zen19S then wasted two ko threats before starting to fight the ko. I understand that this is a consequence of "RAVE" – the program finds that the ko threat is played in the lines that win for it, so it plays it immediately, not understanding that the order of moves is important. The ko threats resulted in a semeai between two groups at the lower edge of the board, in the position shown to the right (the ko is near the right edge). Zen19S impressed the kibitzers by playing move 144 as shown: this is the only move to win the semeai outright, with no ko. A few moves later, it impressed them less when it played at the triangled point, wasting a move to kill an already dead group. Later in the game, pachi2 played move 247 as shown to the left. This appears to me to enlarge a dead group, in gote. I assumed at the time that pachi2 had decided its position was hopeless, and this move was as good as any. (This is contradicted by pachi2's claims that it had an 80% chance of winning, soon before and again soon after this move.) 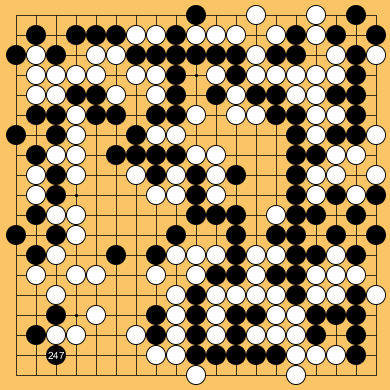 But Zen19S resigned less than 20 moves later. Maybe its move 247 created some aji that is too deep for me to understand. In round 8, ManyFaces1 stopped moving in its game with pachi2. After it had been inactive for 47 minutes, I kicked it off the server in the hope of waking it up. This worked: it reappeared immediately (rather than after the five-minute delay that a kick usually produces), and started to play normally. However pachi2 won the game. After round 11 pachi2 was already sure to win the tournament: it had 11 wins from its 11 games, including two against Zen19S. In round 12 it played against Zen19S for a third time. It appeared to start well in this game too, living with a group at the top edge of the board where there had appeared to be insufficient space. But it started to make pointless-looking moves, maybe starting with move 148 as shown to the right. Such moves, which achieve nothing but are strongly sente, are common for current MC-based programs in very poor positions. They have been attributed to a horizon-like effect: in a sufficiently poor position, moves with high variance are made, although almost certain to achieve nothing, as all variance in a lost position must be upside. But here pachi2 was making such moves, even while claiming that its chance of winning the game was over 60%. I do not understand why it did this. It continued making such moves, and eventually Zen19S won. This game proved popular with observers, and at one point had 130 of them. Réni Coulom's program Crazy Stone has analysed the moves of this game. Its opinions are here. Gomorra, running on an Infiniband cluster using 16×12cores running at 2.67 Ghz. Zen, running on a mini cluster of a dual 6-core Xeon X5680@4.2 GHz 24 GB RAM, a 6-core i7 3930K@4.2 GHz 16 GB RAM, a 6-core Xeon W3680@4 GHz 12 GB RAM, and a 4-core i7 920@3.4 GHz 6 GB RAM, all connected via a GbE LAN. 4 PCs (28 cores) total.